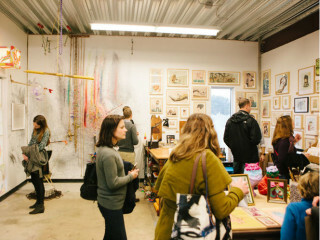 East Austin Studio Tour is a free, self-guided art event providing the public with an opportunity to explore 453 participating art studios and galleries in east Austin while meeting the many talented artists and makers that enrich the cultural fabric of Austin. EAST is divided into four categories: Artist Studios, Exhibitions, Happenings, and Select Events. Artist Studios and Exhibitions are free to the public and open on the weekends of EAST. Happenings are also free, occurring on the weekends of the tour with varying hours. Though EAST is free to attend, there will be Select Events that take place throughout the tour and may require an entry fee. EAST will encompass over 160 locations, showcasing the work at nearly 500 artists. The boundaries of EAST are east of Interstate 35, west of 183, south of Hwy 290, and north of Riverside Dr.